We all are born into a family, a nucleus that will imprint certain narratives or themes impacting how we develop and express who we are throughout the years. Thanks to research from epigenetics, the influence and expression of trauma across generations has been confirmed. 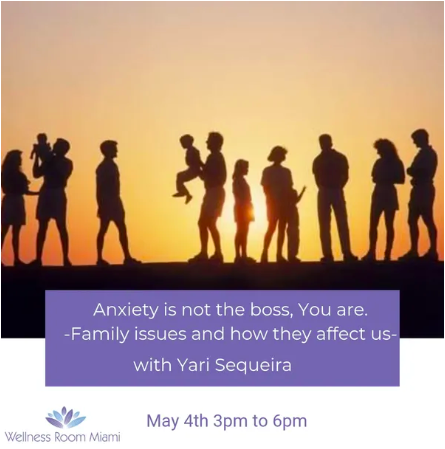 In this workshop, we’ll focus on how family history and/or trauma influence the development of anxiety. Transgenerational inheritance is the transference of emotional, physical, or social pain from one person to their descendants. The conscious or subconscious memory and narrative that surrounds the family dynamic plays a role. Here, the past continues to make itself present in different ways. The descendants of the person who suffered the original trauma will not necessarily develop the same disorders. They will, however, be much more vulnerable than other people to anxiety, stress, and depression. The present generation must grapple with the trauma, find ways of representing it and spare transmitting the experience back to one's parents. Discovering transmission means coming to know and tell a larger narrative, one from the preceding generation. This workshop is part of a series of subtopics around Anxiety. It maintains the goal of expanding the understanding around anxiety, its source, purpose and healing.